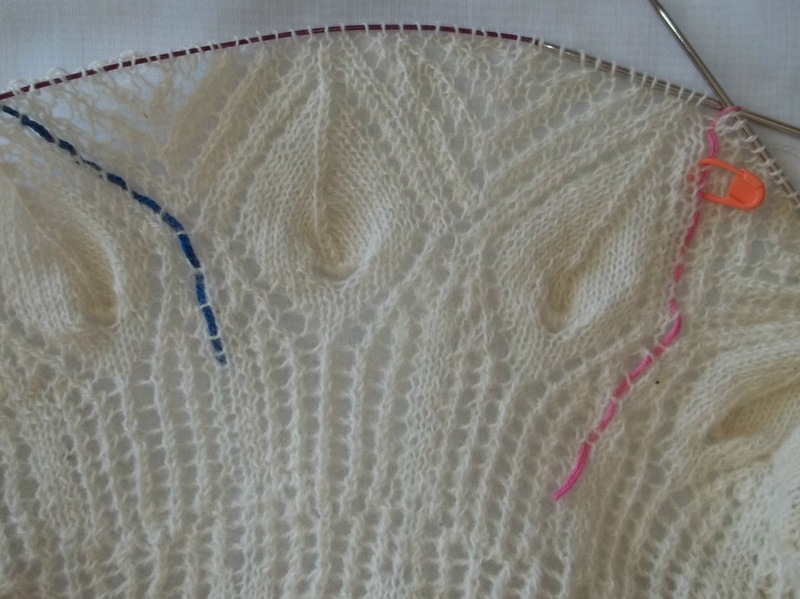 Rounds and rounds of progress, on the shawl, and on the socks. 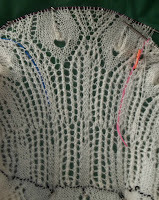 First—2 more rounds added to the shawl--(and still more rounds to come. It's always refreshing to come back to the shawl. It is a bit tedious to knit—and I keep putting it down, and giving it a rest-- I do still need breaks—but I so love it. Every time I pick it back up--its so wonderful to knit. But it's also easy to see, a second (or third or fourth!) crown of lace would be a nice touch. Which is why I am doing the extra 6 rounds and anding the second crown. Remember how it looked 6 months ago? 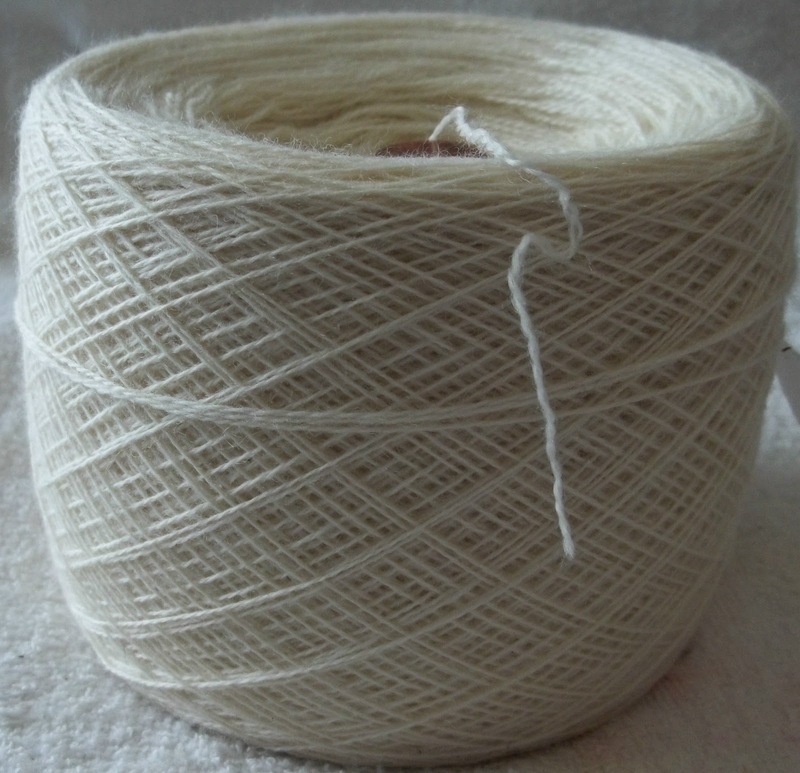 A big, fat, solid 8 oz of yarn. Now, it's a shell of its former self--(and the weight? Under an ounce!) These long rounds eat up yards and yard –and those yard all to quickly add up to ounces. Just a few weeks ago it was twice the weight. I've made progress on the socks, too. Both pairs. The Lost and Found socks are over 6 inches long—and on their way to getting clocks—other than a bit of texture at the cast on/cuff, these are pretty plain sock. Yes, there is my standard inch/inch and half of ribbing, (and a few rounds of edging before the ribbing), but aside from that, it is a plain stocking knit. The clocks are small medallions of reverse stocking knit, and mini cable. Not much in the way of texture or design--but something. The clocks aren't done yet—but by the time they are finished, the leg of the sock will be too. There has been some puddling (not quite pooling)-- which is always a factor in a yarn like this. But I am going to take my chances and make a flap/turned gussets heel. I can live with a small puddle or two. Even if the puddles grow to mini pools. The Replacement socks that I started when the blue green where lost? They too have a bit of fancy at the cast on/cuff--No ribbing though. They are edging toward being 5 inches long. 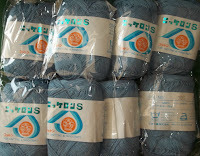 They are being knit in yet another color way of one of favorite brands of self striping sock yarn. One full repeat of the color sequence has been knit, and then some, 2 full color sequences and the leg will be done--this is likely to be slightly long than my standard 7 inches before the heel. These socks will have an afterthought style heel--I really dislike how a flap/turned/gusseted heel disrupts the self striping sequence--and since the color sequence is the main design--doing what I can to keep it intact makes sense. So, big rounds and small ones, plain ones and patterned ones, all round, progress is being made. Actually, It's GREAT news. I gave up too soon! The knitting I lost last week at the DMV?—Returned! I picked it up yesterday--(yet another trip to DMV!) --and did all sorts of errands at the same time. I am so happy about the knitting—It was one of my favorite bags—I loved the yarn--(though it is a style/color that is still available) and I had some 4 inches or so worked on the top down socks. There were lots of other things in the bag, too. I had totally forgotten I had 1 spare circ. 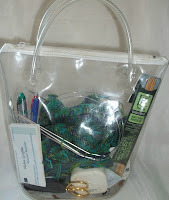 (about a size 4), and a set of bamboo DPN's, there were 2 good scissors (plus a so-so one!) and a crochet hook in the bag, too. (All left overs from class--stuff that got misfiled in my knitting)--and don't forget the pair of circs the sock were on! All of it, (and my $16.72) returned! I gave the DMV clerk $6- Not a huge reward—but it was handy—I took it out of the bag-- and it's enough for her to buy a quick lunch--or some other treat. I also stopped, found a supervisor, and thanked him, nnd mentioned the clerk by name. He was clearly surprized to get a compliment—instead of a complaint. I hope the clerk gets a second bonus out of it. I try to be realistic, and not to let myself get attached to things--(knitting a thing? Never!--It's a true gerund--a continuous state of being! ) but I really was so sad about the loss of the bag—I can hardly contain my joy at its return—I would suggest something biblical –like sacrificing a fatted lamb—But, no, lets not sacrifice a lamb! Let's keep all the lambs—and shear them! I'll use this blog to express my thankfulness! After the DMV I went on a shopping spree. First I stopped at the art store. These are becoming something of a rarity—and eventually found silk paint (Jacquard brand)--and bought 8 bottles (several shade of blues and greens, and brown (no bronze) –We won't go into a discussion here about how I haven't knit a stitch of the shawl for over a week now!--I still have OTHER knitting to do ( a sample swatch to knit and practice painting before I put paint to the shawl!) but, now at least, I have the silk paints I need—and I know where to get more. Then I stopped at Jackson Heights Fabric--which is not in Jackson Heights—which is part of Flushing--but in down town Jamaica. A bit of NYC's crazy geo/political craziness. This is not true for any other borough in NYC--Manhattanites (aka New York County) might live in SoHo, or in the upperwest side, (but it's all NY, NY) and the same for Brooklyn--(aka Kings County) No designation for Park Slope or Carroll Gardens--it's all just Brooklyn and zip code More of the same for the Bronx (aka Bronx county) as well. Fordham or Mott Haven, or Riverdale--All just get Bronx NY and zip. Queens alone has 3 major (first 3 numbers) divisions, and each zip (last two numbers) gets its own local name. And no one (according to the post office that is) lives in Queens, NY! All three towns retain remnants of the original towns center or down town area. Downtown Flushing has changed the most dramatically—It's now Queen's Asian center ---with many Chinese, Korean and other Asian immigrants flocking there--(including a whole section devoted to the Indian sub continent). Jamaica's down town is the biggest (I think) and has always had more shopping (with several major department stores). For out of towner's—here is an easy guide—LIC is where all the bridges and tunnels (to Manhattan) are; La Guardia Airport is in Flushing, JFK airport is in Jamaica.--the divisions are West(LIC), North (Flushing) and South (Jamaica). The 3 towns are relatively old, and each town has one or 2 historic buildings or sites (going back to the 1650, or so!) Flushing (Flushing Meadow Park) is home to most of the Queens stadiums (the Tennis Stadium (the US Open is going on now) and CitiField (home to the NYMets). Jamaica has a National Park--(Gateway Park). Well, getting away from a geography lesson—I bought fabric. It's not exactly what I wanted. 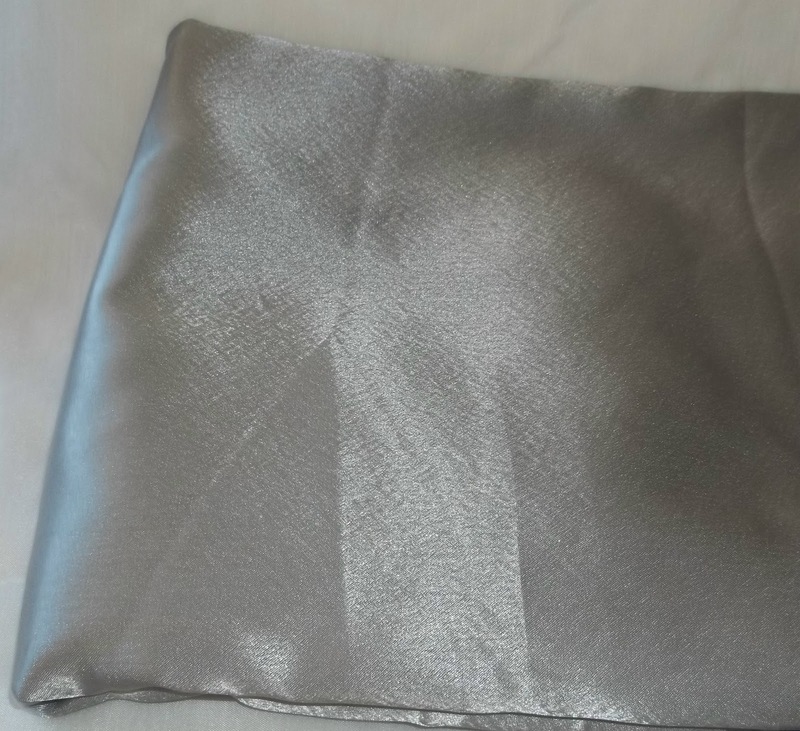 I have seen the exact color and weight fabric I wanted in JoAnnes—but I didn't like the fabric (it failed a crush test (crush a handful of fabric for 10 seconds—how bad/how set are the wrinkles?) --and it was $12.99 a yard. I stopped at both ACMoore and Michaels, too, but didn't buy anything--(thought I was tempted by sales and specials) A couple of hours of out shopping filled up most of the morning and part of the afternoon. I had started the day early--(before my trip to the DMV) at the Blood lab—the white shirted vampires had a go at me first thing in the AM—and did a good job of it—there is hardly even a mark from the puncture. There was still time for quick dip in the pool in the late afternoon. But I was too tired last night to do any knitting. It's the cycle of life for knitters! I have several new(ish) knitters in my circle of friends—at times, some of them are over-whelmed by what they perceive as my generosity--(and yes, I guess I am being generous) But I don't really feel I am being generous.. I FEEL like I unloading unwanted stash! 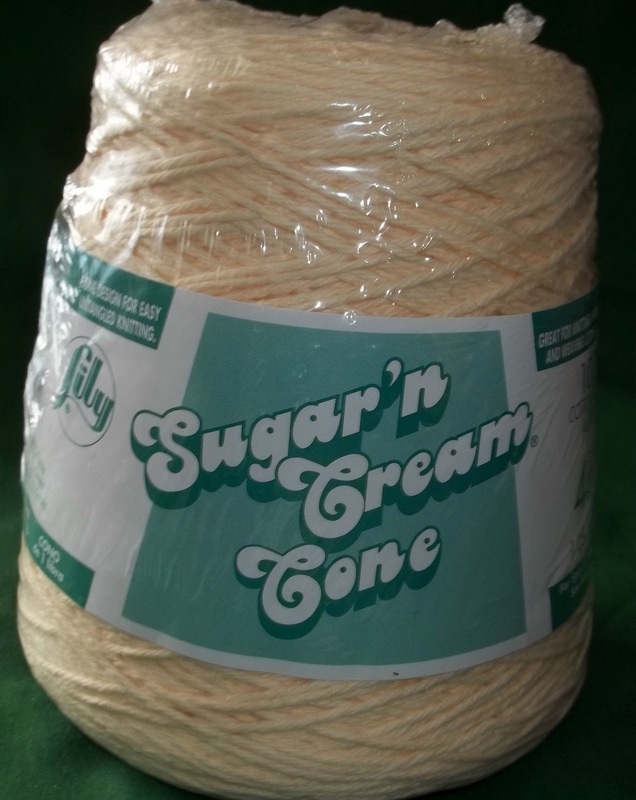 Out with the old—the stuff I bought on sale, (with good intentions) that, I now realize, I am never going to knit. Out with the yarns that were trendy—and now look passé to my eyes. Out with the yarn made from inferior fibers, or garish colors or... some other fault. 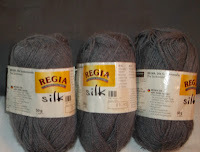 Out with lovely skeins, too-- wools, or angora's or other luxury blends... the odd ball of two that no longer speak to me. Out with wools that I bought to design and test and pattern with—but the fiber got discontinued—and who wants a pattern for a discontinued line of yarns? It seems, no matter how fast I pass off balls of wool or acrylic, or smooth worsted, or fluffy novelty yarn—MORE yarns appears at my footsteps! Here is the latest addition to my stash—a gift from Tracy S—who moved and decided to cull her stash of the yarns she has re-evaluated and that didn't make the cut. I took the cone of off white cotton--(another bathmat will be made sometime soon) but passed on the acid green skeins of cotton (dozens and dozens of them!) They were originally destined to be market bags—but goodness know I already have enough market bags with out knitting more.. and really ACID green?--Though, I am sure it seemed like a good idea at one point. 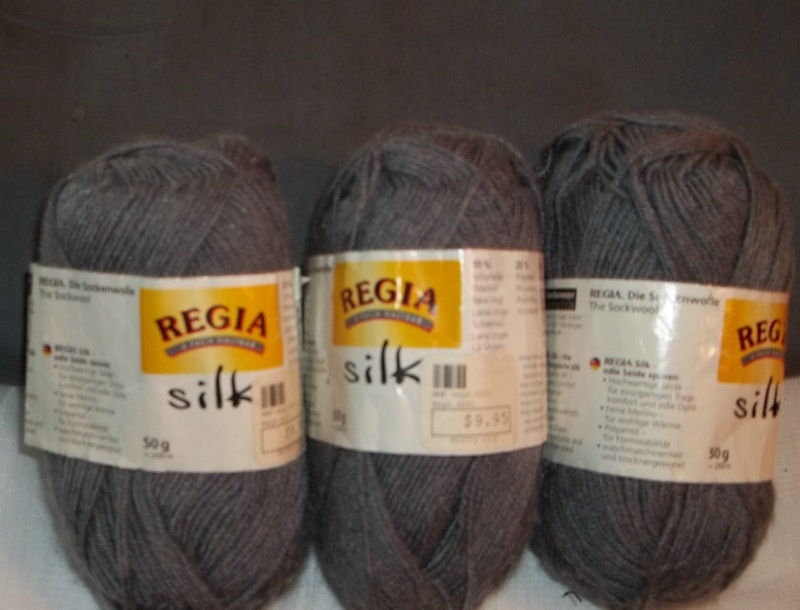 First there is the lovely Regia Silk sock yarn-4 skeins of it (one was balled up, and didn't make it into the photo, but its there.) 2 of them could become a pair of socks.. Or maybe a scarf--Look--I have some grey fabric (a cotton twill) for a skirt— What a perfect match! But, then again, I already have a half dozen pairs of socks with grey in the mix that would also match—so I could/should make a scarf/mini shawl. Maybe socks first, and the left overs (I always have a bit of sock yarn left over) added to the second 100 grams to make a scarf that is a smidgen bigger than one I could make from just 100 grams (there are lots of patterns for mini shawls that just require a 100 gs of sock yarn). Something lacy -but still casual. Then there are the bright cheerful colors of this OnLine skein—Grey, brick red, and bright blue- Check, check check for color matches! These are the predominant colors all match clothes I own, or will soon own (I already have fabric). Which one should I knit first? Well in theory—(and reality)-- What I should do first is one of my collection of sock kits from my home made sock club collection! Speaking of which—I could only lament the loss of the socks I started early this month so long—I've cast on and knit the cuff on another (new) pair of socks. Just like the lost pair—I haven't decided if these are secret socks or public socks—so by default they are secret of now. 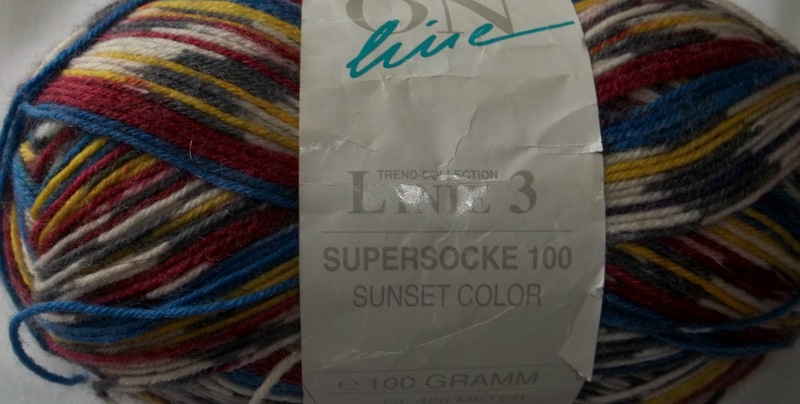 The yarn is from one of my homemade sock kits—and will go with clothing I already own--(or fabric that I own and plan to make into something) It's still in stock and available--so it could be for a pattern. Meanwhile—I continue to cleaning out closets—2 huge bags of clothes have already been donated to a local charity—and 2 more have been packed up for the next trip. My closets are slowly being emptied of old, too big clothes—A few pieces I really like with be altered (1st requirement—they must have pockets)--but the majority are going away—and the piles of fabric that I have amasses over the years will be worked up into some new clothes—I know, I have been saying this for a few years now—but I did get some sewing done this spring—and I will get more done this fall. I have to!--Almost nothing I own fits--and I don't want to be wearing skirts that are so loose that they fall off! Besides, many are too long and dowdy looking now that I am thinner. Well most of the fall sewing of casual clothes will have to wait till after the I finished the shawl for the wedding, and my dress, and my daughters wedding coat. But not much longer than that. I haven't lost as much weight as I had hoped—but I have kept off every pound I have lost.. And I have worked out in the pool this summer and turned some fat to muscle. Not much of change on the scale, but I am a bit trimmer, tighter and more muscled. I will make some renewed effort—for no other reason than its healthier. And in the end, I think the gains have won out. But—I had already agreed to buy (at a substantial discount) my younger sisters (M) Mitsubishi Galant—a mere 10 years old, and with half the mileage. 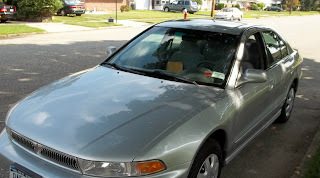 A used car is always a bit of pig in poke—but I have bought a used car from my sister before (and I think, if it hadn't been total (hit while parked) I might still be driving that car!) and while no one knows what the future hold, I feel I have better odd with her car than I would have with a strangers. But now the pressure was on. I was worried about how drivable my Mazda was—In the end, I made the right decision to have it towed Monday. I managed to drive it out of the large underground garage, and that was it---It was reluctant to go up onto the bed of the flat bed tow truck—but since it was in an easy access position—it didn't really matter—the hoist pulled up the last few feet. Tuesday started the process of the getting the new car. I got a lift to Hicksville (where the Galant lived) and then headed to the DMV—where I got a bunch of forms--(some of the useful, some incorrect)-- and then back to Hicksville (several of the forms required my sisters signatures). On Tuesday, I didn't get past the ticket counter (where the forms are dispensed). Wednesday, I got as far as to a clerk—and was informed that 1-I didn't have the right forms, (1) and 2-the forms I had, weren't filled out properly. The rub was—my sister hadn't changed the title—so she couldn't “sell me the car” (since officially, without title, she didn't own it) So while I could register the car, (and did on Thursday) and I could put in for a change of title (and did that too, on Thursday) I couldn't buy the car (that is, have it titled in my name). So a whole bunch of different forms needed to be filled out (and signed by my sister). Armed with a whole new set of forms, I returned to Hicksville (and then home)--but not with out a mishap. No, the car is fine—it was a knitting loss! I had taken the socks with me to keep myself busy at the DMV—and just before I left—I went to use the ladies room. It was a bit of mess, and I looked for someplace reasonable clean (and dry) to put my tote bag (with paper work and plates from my old car) and another place to put my knitting bag. I had left the house with the knitting bag in the tote--but I had taken it out at the DMV while I got all the papers in order (or what I thought was in order). I never put the knitting bag back into the tote bag. So one of my favorite little project bags, and a pair of needle, and socks (already started) and the rest of the yarn, and 2 pairs of scissors--(one very nice one, and one cheap pair), and a favorite pen—GONE. In addition, I had dumped some money in the bag--I stopped and picked up a quick breakfast at a drive through window, and had dumped the change ($16!) into the knitting bag “for the moment”--and never got around to putting it properly away. Worse—I never realized I had forgotten the knitting--not till I was heading (one last time) to Hicksville and the DMV on Thursday.--I might have had a scant hope of recovering it Wednesday—but not 24 hours later. As an aside--Queens to Hicksville, from Hicksville to DMV (Garden City) back to Hicksville back to Queens—is about 50 miles,(each trip)--I used $20 worth of gas over the 3 days. Doing it 3 days in row—was tiring--mentally if not physically--especially when there was nothing to show for it! The good news was Everything was order Thursday. I am now the registered driver (my sister is on the way to being the titled owner), her plates have been turned in, and she is now free to drop the insurance on the car. Sometime in the future (about 2 months from now) —when she gets the title there will be yet another trip to the DMV to transfer the title one more time (from her name, to mine). In the general scope of things, most people wouldn't pay for a car with out getting the title—but it's easy to trust my sister—so its not a problem. I didn't get any work done on the shawl—232 is the last round completed—but on the other hand, I had the good sense to take socks with me to the DMV—and I lost socks (a sad loss) but in the scope of things—not an unmanageable one. The loss of the shawl would have been--well devastating! As I said in the first sentence, All in all, there are more gains than losses. Good News—A quality replacement was hand. About the shawl—Rounds 230 (plain), 231 (pattern) and 332 (plain again) are done. Maybe more will be done today--(after DMV and the pool!) or maybe not –I stumbled on a bunch of recycled books, and I am re reading The Thorn Bird—which I read eons ago--(in the hardcover, before the paperback edition came out.) It's amazing how much I forgot—Its almost like reading a new book--(with characters I know). 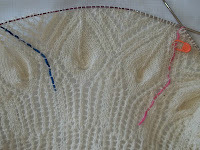 The tip of the feather motif is now 5 stitches wide (it started at 19 stitches wide) and last seen it had 7 stitches. The next round, there will be 3, then it will be a single stitch and the solid stocking knit feather will be gone! 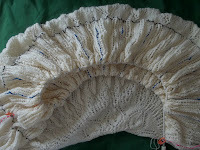 What remains after that, is finishing the lacy top the feather. 6 round (minimum) or will it be 12? (It could be as many as 36—but there is no way that is happening!) and 2 plain rounds before binding off. I am behind schedule—but I still think I will be finished before the end of the month. Wednesday—was spend teaching—a favorite student. She learned to cable—and to do the brioche stitch—and was wowed by both of them. I was wowed by her grasp. The change was –as she said—snake like—I corrected –and said the general term was serpentine. And her eyes lit up ---she has poor vision (I am amazed at how well she knits given her limitations!) and was pleased that what she perceived was so accurate. Mind you this work was all done on big needle (size 10.5) and big bright (orange) yarn. 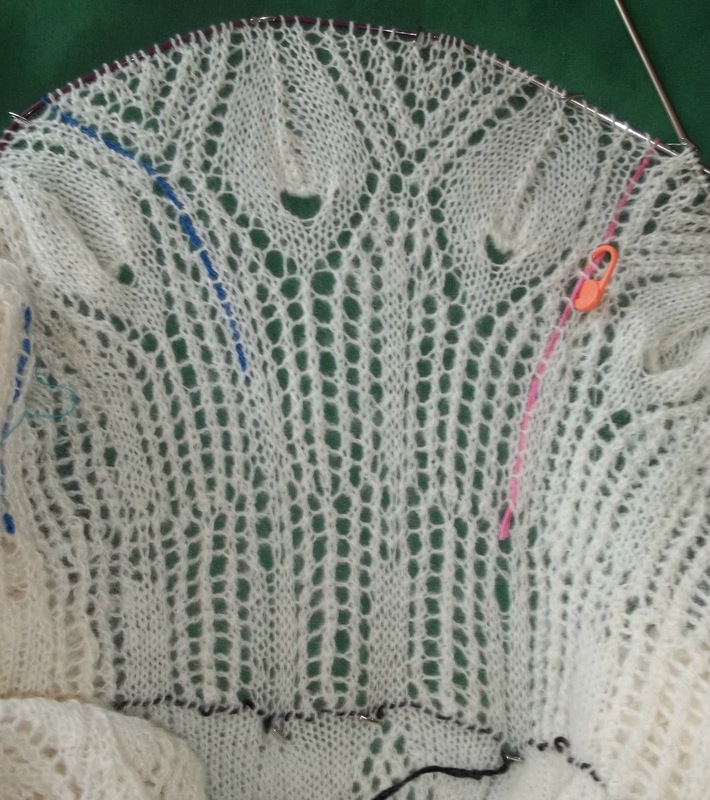 Her project is going to be done with some fine mohair, (really beautiful stuff) on size 9 needles--the yarn will be held doubled--the effect will be open, almost lacy. It will be beautiful. But a easy to knit yarn to learn the technique is the way to go! We discussed how to work the edge the mostly stocking knit scarf—she didn't want ribbing (I didn't think it was a good choice either) Nor did she want garter or seed--(to boring and plain) so we work the some sample edging into the swatch. First I cord, then simple double knitting—and found a winner. I love that she is such a thinking knitter—she discovered Pat Ashford and Steve Plummer— (of WoollyThoughts) via their book Knitting Without a Pattern on her own. And loved their ideas—I told her I loved them too—and MY reasons were totally different than hers—but as she looked through the book again, she grasped some of the mathematical ideas I was talking about... and said she hadn't seen these ideas and would have to re-read some passages—and see if the ideas were directly referenced, or if she would have to work some of them out on her own. I haven't read that particular book—but I guess its a little bit of both! It's sock weight—Or perhaps even lace weight. I wonder if it would make good socks? 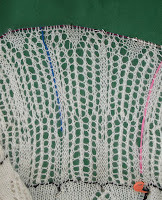 Or should I plan on a light weight lacy scarf (What an other scarf? Didn't I just swear off scarves last week?) 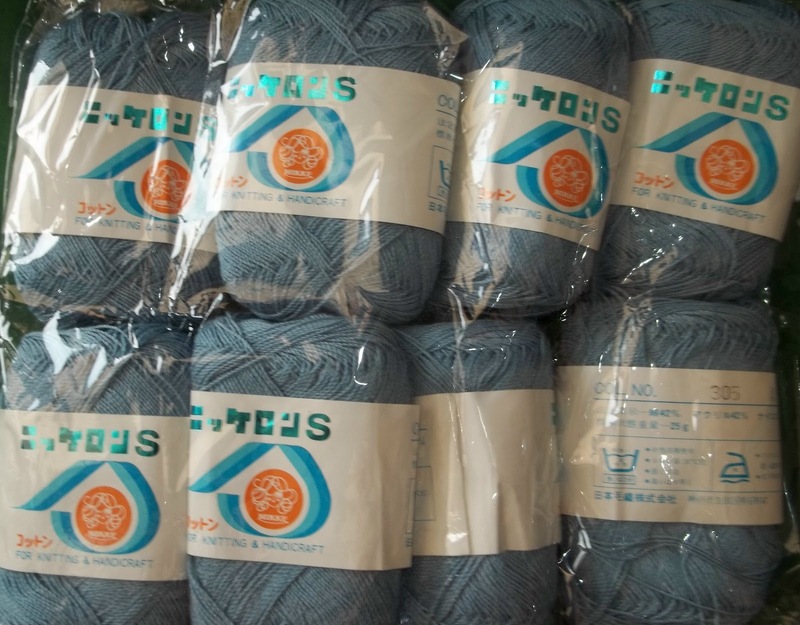 This was an unexpected present from my sister G(who lives in Japan) and scours thrift stores for interesting yarn—that she send to me! I give yarn away all the time, too. I think all knitters do—I wonder sometime, are there skeins that make there way a round the world before they get knit? I have already posted on Face book a request to have the fiber list translated—but if any of you dear readers know—please post! Not so very long ago, when fashion (all sorts of fashions) were driven by quality. Details mattered and so did individuality. I still like the quality details in my clothing. No, I don't bind each seam with seam binding...I quickly overcast each edge with a zig zag stitch. No, I don't tie knots in my thread to bind them off, I do a quick machine back stitch. No, I don't hand stitch my buttonholes with buttonhole (heavy weight) silk thread, or make bound buttonholes. Well that is for the most part. In my recent bit of sewing, I did bind some seams with bias tape-(OK it was sewn on with a zig zag stitch)And while I don't employ fine details for everyday clothes, I have done all the fine details (and many others) to some clothing—over the many years I have been sewing. When I made my wrap around skirts, I didn't (as suggested by the pattern directions) hand sew the waist band seam in place, nor did I hand sew the back edge of the collar on the camp shirts. For the skirt—I used the simpler, faster “stitch in the ditch” to sew down the inside waist band (one of those edges that I bound with bias tape)--and for the collar—I used self made bias tape to finish the back neck edges. Both of these methods are faster—and could be called “factory” methods—they are more commonly (or rather were more commonly) found on better mass produced clothing—though now days—even supposedly “better dresses” tend to have serged seams. Same goes for my knitting. I like my knitting with finished, tailored edges. I dislike—for the most part—simple slip stitches as a selvage. I don't like rolled edges (I hate rolled edge!) --I think the sweaters with rolled or unfinished edges look amateur and sloppy. I do take some short cuts—I have made simple skirts with out a pattern, and didn't do much more that sew two squares of fabric together and add elastic and call it a skirt—but even these simple projects had details like set in pockets, and finished hems. I like to use bias tape (very frequently self made bias tape) to finish edges.. and while this seems to be an easy finish—there are details even with this method make a difference. 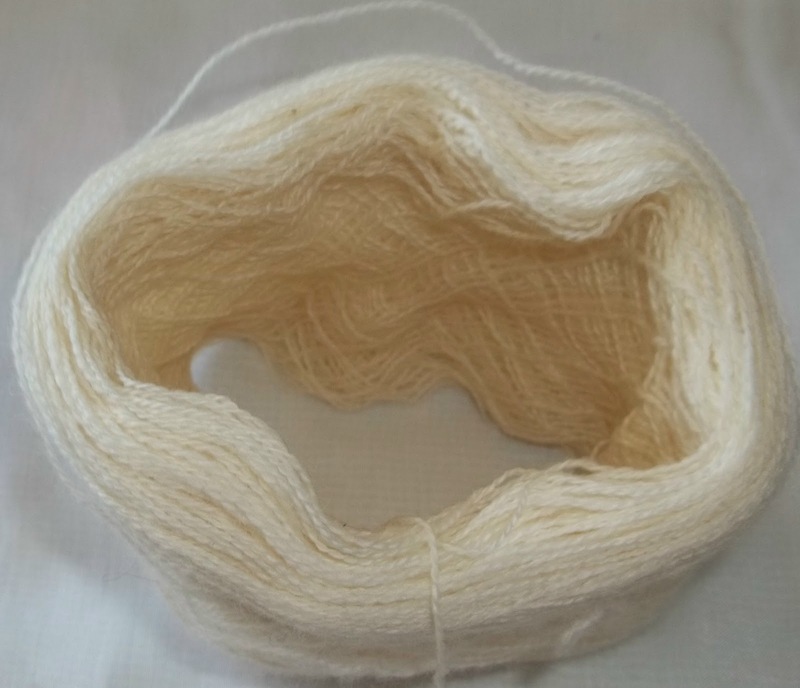 The tape need to be eased into a curved edge—Never gathered –but eased so that when you turn the tape under, there is enough stretch to sew the tape flat. It should be under stitched as well—under-stitching is one of those fine details that make or break the look of finished garment. I recently been visiting some on-line sewing sites—and well I guess my view on fine, tailored finished details are considered passé—the samples I sew are crude lack these details. Edges turn out, or cupped or show wrinkles—all would fail inspections in a garment factory—even by todays crude standards. Don't get me wrong—I brag all about my home made stuff all the time... I point out “I made this”--and time and time again, people are startled—they think they are paying me the highest compliment to say, “Wow—it looks as nice as anything you could buy in a store.” They don't realize that looked at from the inside—my clothing is far better constructed than any thing you'd buy in the average (or even above average) store. I will be starting to make my dress for my daughters wedding next month—I suspect it will cost about $100—just for the materials—But in looking—I haven't seen much in the way of dresses that cost twice that amount (many 3 time that amount) and when I look at the details of these dresses, I am always disappointed—they cost more than the average dress (OK formal wear does require more fabric) but they are constructed with the same fast and dirty techniques. Serged seams? On a “better dress? Not for me. 5 rounds will do that. 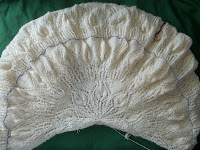 The feathers grows taller and narrower, the lacy fan between the feathers takes shape, too. What was just hinted at a few days ago, is now emerging. The simple lace stripes will be a open lacy crown to each feather tip. I was tempted—late last night--to start round 223—but resisted—I know better than to start to work on a patterned round when I am tired. I did a round on my socks instead—more about them below. Two full rounds, in a day is my current goal—and I reached it. If I keep this up--with the end in sight—I will be finished before the month is out. Plenty of time! (I still have to knit a small swatch to practice the hand painting on—it will—unless its a total disaster—become a lace cover to a clutch for the wedding. 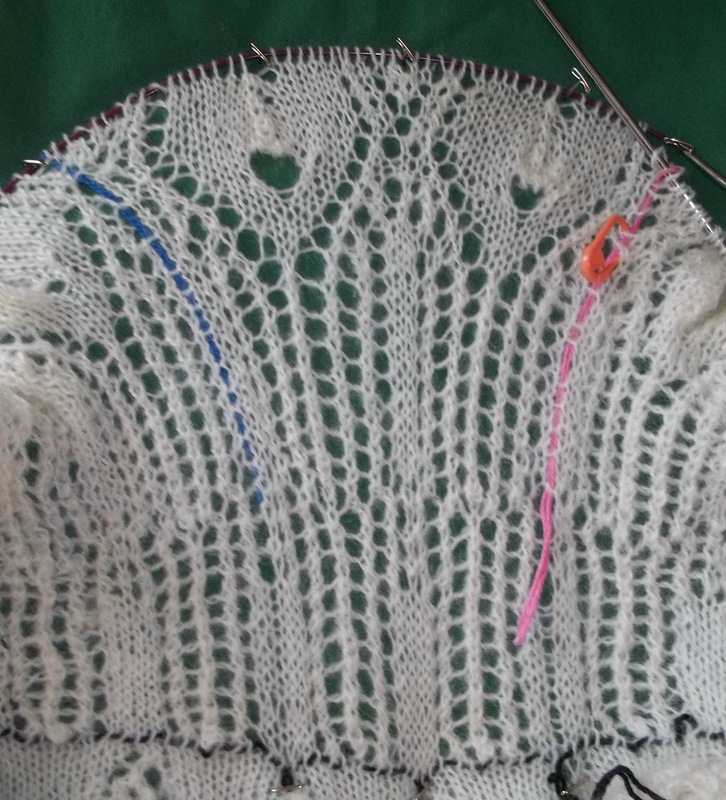 But I am so happy to be coming to the end of the knitting, and having this shawl done! Which is good, because I want to knit something else—anything else!--I love this shawl—but its been months that I have been knitting it! I had a bit of an adventure in round 221—a stitch--one of the center decreases on a feather-- dropped. And down it went for 5 rounds! 2 double increases undone! It was a heart stopper—for a moment. But I recovered. It's a long way back to the life line--(though the center of the feather would/could only drop to be base of the eye). I will get 2 more rounds done today--the patterned round in the day time, the plain, tonight. Likely, I will skip work on Sunday—I can't get two rounds AND the crossword puzzle done—and I want to try to get the puzzle done. I got almost every cross done this week—Last night I picked up the magazine to discard it—and one last glance and the answer (a pun) came to me, and I just about did a hand to forehead slap for not seeing it before now! Now its done—save that 2 words are missing vowels—None seem to make sense--or I don't understand the clue. Which is quite possible as one is a sports reference—and I am not good at sports—and don't always have the required vocabulary, either. But I don't mind—the Sunday NYTimes puzzle isn't the hardest puzzle (though some think it is) but I am happy when I get most of it done. The socks are turning out to be very plain ones—pretty yarn, and an attempt at a scalloped border at the cast on edge(cuff) that didn't end up as nice as I had hoped. I thought about a stitch pattern, but couldn't settle on any one I really liked. Besides, the yarn is pretty busy—stocking knit is just fine. 3 More Rounds--but no Photo. I am back to a normal pattern of ending with a one plain round —something I hope to keep with for these last few rounds. Since yesterday, I have knit round 218 (plain) 219 (pattern) and 220(plain). Next up is round 221-- of 235! 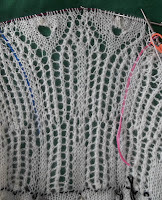 --8 more patterned rounds, (and 8 more plain ones) + 2 round as a edge; that's 18 more rounds to the shawl. 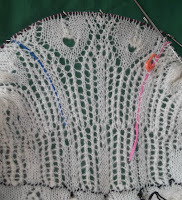 Then I can bind off--or plead insanity, and add 6 more bonus rounds! I am actually considering the 6 extra rounds and a lacier finish to the final set of feathers. My goal now it to have it done by the end of the month—to keep up with the 2 round routine—even if I take a day or two off as I go along. Round 219 was my correction round. Somehow, small errors do creep in—some of the feathers were a stitch short--(somewhere I missed or dropped a YO) some feathers had extra stitches.. (how?!) some feather were not centered (the raised center decrease wasn't exactly in the center of the leaf. In all, about 5 feathers (of 60) had some small defect—but now each of them is perfect. Now that it's almost done—I need to find an art supply store and find me some silk paints. Art supply store are having a rough time—Big box stores like Micheal's and ACMoore carry a lot of the basics (and cheaper, I suspect, but I haven't been pricing canvases or brushes)--but they don't carry specialty items like silk dye or silk paint. They have some cheap dyes for cotton (tie dyeing T-shirts)--and some stock some dye supplies (synthroll (sp?) for one) but few have mordants (many are toxic) and fewer still have acid dyes or silk paints. Silk paint, unlike dye, doesn't need heat to set. Paint it on, let it dry, and its a permanent color. But art stores have a hard go at it, competing. Pearl (my favorite art supply store) went under a few years ago, and a local (well not really local anymore, but local for years when I lived in Little Neck) store—Ben's Artarama is gone now some 8 years. Ideally—I find someplace on the island—or will schlep into Manhattan—I am sure some of the great art supply stores on east end of 14th Street are still there. I'll bring a feather with me, to color compare. Until I stopped and really looked at the colors--I never realized how much bronze could be found in an actual feather. I hope I can find some paints that have iridescent qualities.. the feathers really light up and change colors.... I'd love to be able to capture that quality. Well 214, 215, 216, 217 that is... and 4 more round have been knit. And once again, I have ended at a pattern round, not a plain one. I didn't get as much knit as I hoped or planned, but 4 rounds, is still 4 rounds. There are enough rounds now that the lacy fan between each of the feathers is a bit more evident—and the feather is taking its final shape. 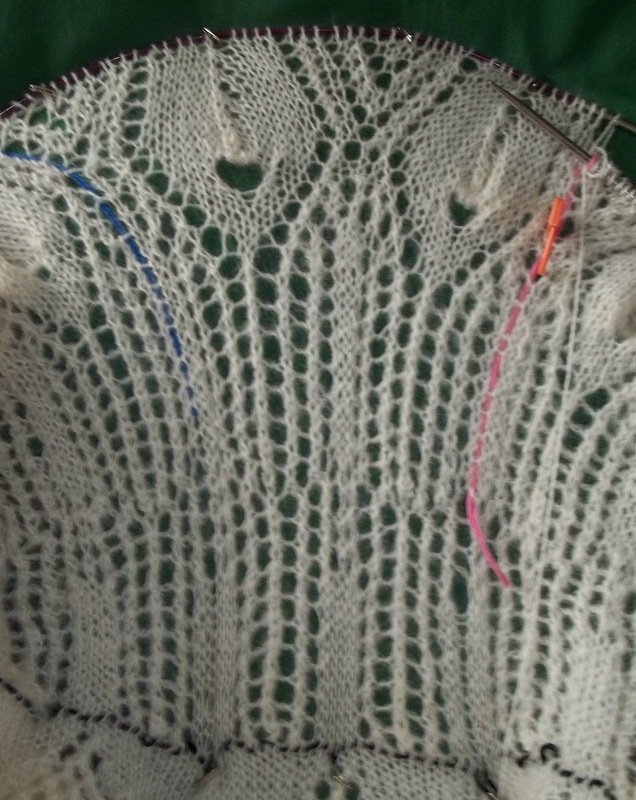 There will be a border of lace after the feather is finished, too. Each row is just a bit different—but the feather is simple enough, and lace makes sense. All I need its a quick glance at the chart before I start—to check that what I think should happen is what is charted then I just knit away... Till my fingers cramp up! Its time then to stop and admire my work and marvel at the progress. There are just 65 days left, and oh so much to do! I still haven't lost more weight—but working out in the pool has turned some flab to hard muscle, and I have lost some inches—which is just as good! 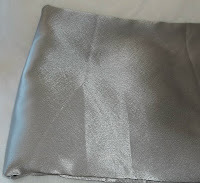 I have begun to make lists.. fabric for first version of dress (cheap stuff!) fabric for dress (What to buy?--and where?) Tomorrow is going to be a rainy day—maybe I will try out the fabric store in Jamaica that a friend recommended—I need to check the pattern and see how many yards I need—incase I find some fabric I love. I will need shoes, too! And its not too soon to begin to look for something. Plus there is the matter of the wedding coat.. Fabric is needed for that, too, and time to sew both the mock up and the real thing. That 4 sewing projects to complete along with the shawl. What am I doing sitting at the computer? Or is should I say It Has Eyes? 60 of them! Amazing the change that 9 rounds make! I've ended on a pattern round--(each set of pattern/plain rounds now takes 3 hours!) 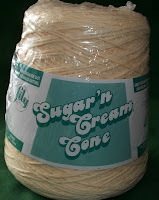 --I just didn't have it in me to knit another plain round last night. But 1 more plain round, and the next pattern round is 215—then there will be 20 more rounds left. I am making progress-- Visible, tangible progress—The count down is on to the wedding day, and I will be finished in time! Today—a doctors appointment—I won't bring the shawl on the subway, and to the doctors—I won't have enough waiting time to complete a full round—so I'll do some work on the socks. Tomorrow—a whole day of sitting around waiting, and not doing much of anything—but it will be indoors, and air conditioned, and well lit—and it will the perfect opportunity to get a few rounds done. Maybe as many as 6 rounds--(9 hours of knitting? No, I don't think so—but 4 rounds for sure) I find it's as much as I can do to knit 2 rounds one patterned and one plain back to back—my fingers start to cramp up. But If I get a round today and 2 more rounds to night, and 4 more rounds tomorrow... well! That's an ambitious plan! But its so much fun to knit now. The feather is taking shape, the fan of lace between each feather adds interest, too, making each round different—and for me, that is a good thing. One of the more frustrating parts right now, is A—you can't see the whole of the shawl...folded this way, you can see most of the first 3 tier/rings of the shawl.. (each chart is one tier) Turn it over and you see how bunched up all the stitches are on the needle! Which is problem B-- there are too many stitches for the needle. It's hard to move them round, and more than once, I have given a yank—only to find, I have pulled 2 to 32 to Oh, sh#t! Way to many stitches! off the needle and I need to stop and catch them before they run. 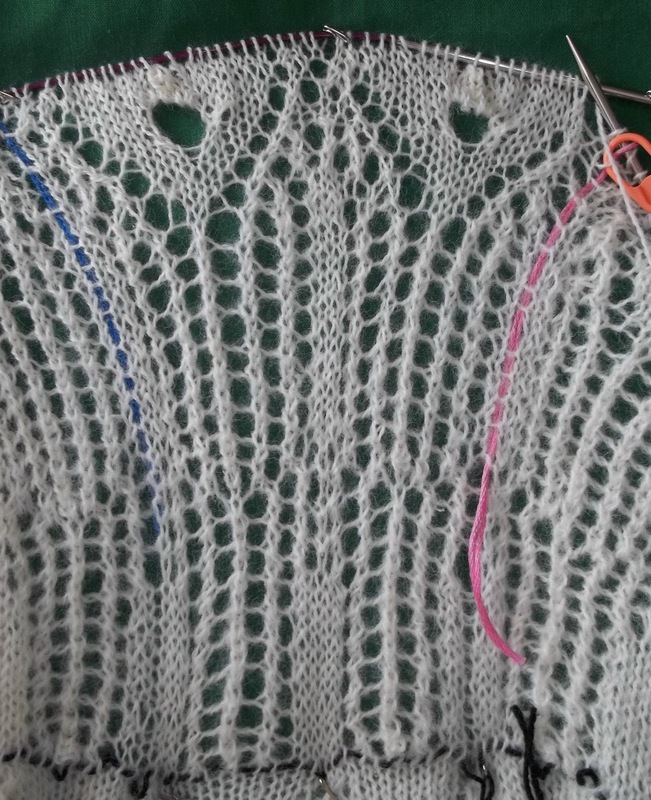 One advantage of loose open knitting, is the stitches are reluctant to run--(though they have—but not far) I suppose I could stop and add an other life line.. but I don't want too. I just want to knit and finish it! There are less than 70 days till the wedding... and I still have thousands and thousands of stitches to knit... And I haven't knit any for days now. Yesterday was the bridal shower—and I helped out with work (the bridesmaids did the planning)--picking up the cake, and the party gifts and party favors, and the florals, too. It was a lovely day—hot—put plenty cool inside the restaurant's. Emily and Matt received so many lovely, beuatiful gifts. But goodness knows where they will put all the stuff! Emily's apartment was not small, (2 bedroom) but when Matt moved in with all of his stuff, it became a bit overstuffed... And now a truckload (really, they filled the bed of the the F150 pick up truck!) full of more stuff... Some of it, things Emily wanted (like Kitchen Aid Mixer) are so big.... (and she has counter space that can be measured in inches..) They will have a real job of sorting through and organizing things. It was wonderful meeting some of Matt's family too, his father (and grandparents) and aunts, et. al., were neighbors--they lived just 2 blocks away--and went to the same school--well--sort off. The parochial school I went to, (OLM) had 2 schools--a boys school (with 1 order of nuns, and a totally different philosophy and educational program) than the girls school--with had a different order of nuns--So I really knew very few boys of my own age from grade school. (and Matt's father is close in age to me) But my youngest sister remembers Matt's aunts (all of whom are 3 to 20 years younger than I am--and even remembered playing games in Matt's grandparents house.. Small world, isn't it? As for the shawl, I did get a few rounds knit in the past week; I am now working on the “plain round” that followed the make 9 stitches in 1 (the full part after the large eyelet eye) —and that brought the stitch count to 1560—So now the real work starts. The end is in sight—but it's still far far away! I'll finish the plain round, and get (I hope!) another 2 more rounds done by tomorrow—and show you a photo of my progress then. But sheer row count, chart 4 is half done and then some. Only 30 rounds remain till completion. 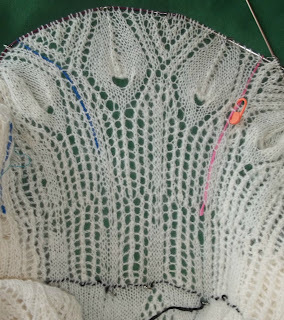 The next two rounds will create the huge open eye of the feather, and then the killer round—when 9 stitches are worked in the double yarn over (a net increase of 8 stitches per motif). These last 25 or so rounds, will be, by number of stitches, about 25% of the shawl. 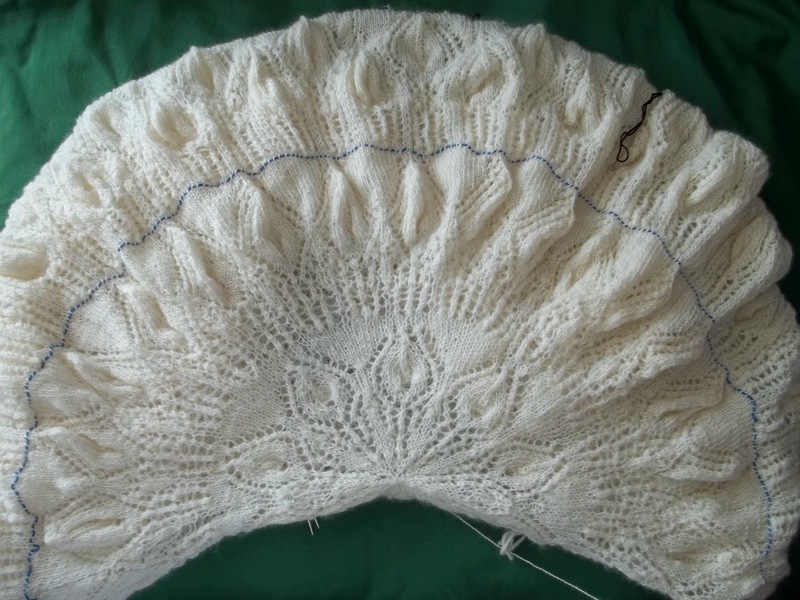 The shawl doesn't progress is strict geometrical order, and the percentage of stitches (in any round) aren't easy to figure.. but it doesn't take much of a mathematician's to figure it out. I started with 10 stitches in a round.. and didn't consistently go over 500 stitches per round till chart 3. 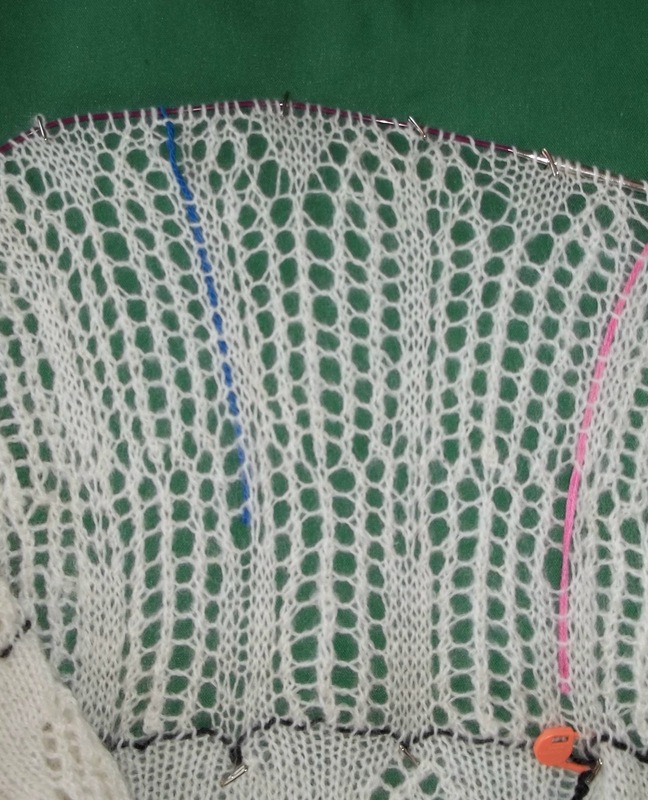 Unlike the feathers motifs in previous charts, that were shaped with decreases in the feathers (and net decreases in the stitch count) —In this final ring, the spaces between the feathers are lace (not stocking knit) and the lace is a giant wedge that get bigger each round--the stitch count remains stable at 1560—the feather has decreases, the lace wedge fan has increases and they balance each other out. But I am happy with my progress this past week—and while the huge stitch count per round will be a challenge—it will be tempered by the appearance of the eye and feather, and fancy lacy between each feather. It will be a wonderful knitting. The last few rounds of the stems --(basiclly the same round repeated over 20 times) were pretty boring! I had errands to run yesterday—Car inspection for one—and didn't want to bring the shawl with me, so a pair of socks were cast on. I haven't decided yet if these are public socks, or secret ones.. So for now they are secret—Yes, I am knitting socks. 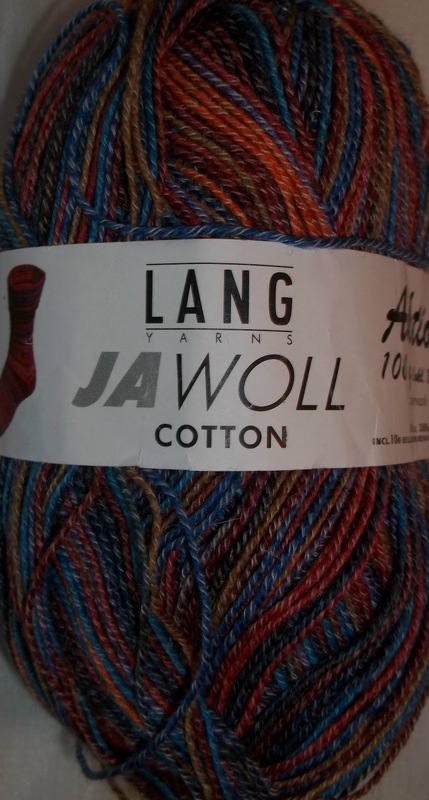 But how, (toe up, top down or some novel way), in what color, and with what yarn, using what stitch pattern? Not being disclosed. Let's just leave it at socks.